Review the critical moment in the Russian GP when Lewis Hamilton overtook title rival Sebastian Vettel. Vettel had snuck ahead of Hamilton at the pit-stops. 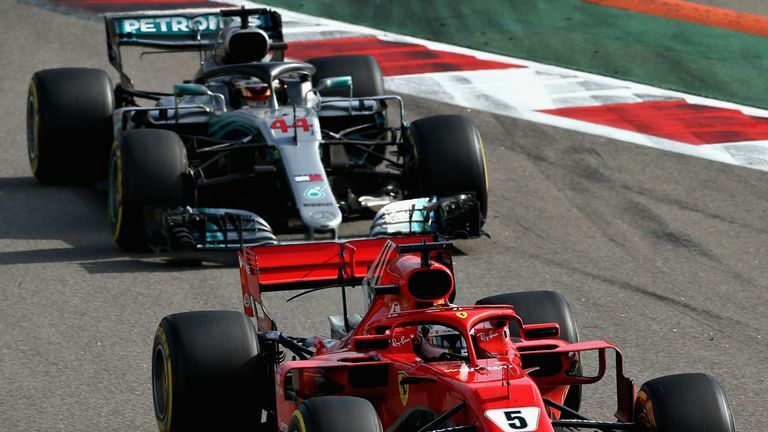 But Hamilton immediately hit back, overtaking his world championship rival despite nearly running into the back of the Ferrari on his first attempt to pass the German. Vettel's move when defending his position was placed under investigation by the stewards but the Ferrari was cleared of any wrongdoing. Sebastian Vettel: "I was struggling in the last sector, so Lewis was close and then had a run into Turn 2. I managed to cover and then I didn't see him through the left-hander, I wasn't really sure where he was. I saw that he was somewhere on the outside but then I think you also need to be at some stage fair enough and give room, even if I didn't want to, but I had to, to make sure that it remains fair, tough or hard but fair, but then he obviously got past." Lewis Hamilton: "Ultimately, for me, he did move over to the inside and then he moved again and nearly put me in the wall. I thought that was a double move. I guess they didn't see that. Nevertheless, fortunately I was able to stay out of the wall and still get round the corner, and then it was a question of who was going to brake earlier in the next corner and I wanted it more at the time."